Friday morning, hot and humid. My first order of business was to find a tailor to make a jacket. Beautiful Thai silk has been on my mind and wish list since we visited Thailand a few years back, and my current professional demands can justify another jacket. Well, ok, that’s really just an excuse for getting something I’ve wanted for three years, but I’ll use any excuse that might work. Once the tailor was found, color picked out, measurements made, and price agreed, it was time to begin the temple tour. Armed with my walking tour map, helpfully provided by the hotel, I set off on a mission of conquest – Chiang Mai has an astonishing number of Buddhist temples (as many as Bangkok), and I had made it my goal to visit them all. I soon learned, however, that while old Chiang Mai is compact, it’s not that small, and after the third or fourth temple, I began to weary of untying my shoes to walk into the temple and tying them on again to continue the tour. After the fourth or fifth temple, I began to feel a sameness between one and the next. The extraordinarily ornate decoration; the way-more-than-life-sized Buddha statue (interesting enough, but not really artistically compelling); the tourists – from Germany, from China – taking a thousand pictures. [Full disclosure: I’m equally guilty.] But still I soldiered on. By one in the afternoon, shirt soaked and hair frizzy from the humidity, camera bag becoming an ever heavier weight around my neck, I realized I was footsore and hungry. Maybe not an emotionally profound revelation, but very important in its own way! It was time to look for a small restaurant and then a quick way home for a little rest. At a roadside restaurant with open air seating and an English menu, a bowl of pretty good pad Thai noodles and a bottle of water, brought to the table in about five minutes, cost only 80 Baht, or about $3 Sing, even less US. Somewhat unusual for Thailand, the table setting included chopsticks. One of my guidebooks said that Tha Phae Road is the main commercial road in Chiang Mai. – anything you want can be found there. That conjured visions of Singapore’s Orchard Road, with mall after low-rise mall, tourist souvenirs shoulder to shoulder with luxury goods, silks and jewelry and antiques, all waiting to be browsed. And I discovered that the second biggest city in Thailand is definitely not like Singapore. Shops are all small and local. 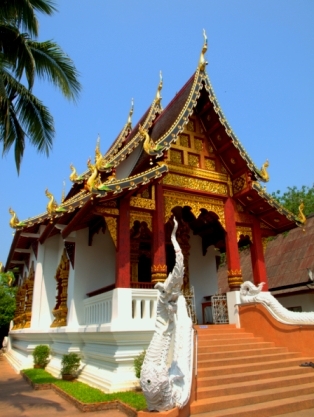 Go to Bangkok for luxury goods and high-rise malls; Chiang Mai is for crafts of all kinds, country and commercial. 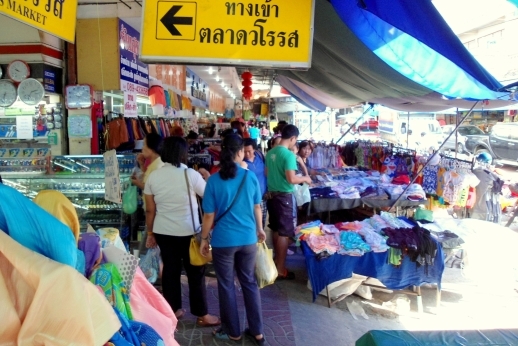 Tha Phae Road is lined with two- and three-story shophouses, mostly not air-conditioned (though the fans make a pleasant breeze), sometimes open to the street. The sidewalk is narrow, uneven, obstructed, and has a steep drop-off to the street. A few pedestrians navigate these obstacles, but the street is choked with traffic. It’s not exactly charming in an old-world European style, but definitely intriguing. There are treasures to be found if you have the patience to search. I didn’t see the silk shops as promised on Tha Phae. When I wandered down a narrow side street, dodging people and traffic, I found some small shops, bolts of fabric stacked all the way to the ceiling. Some of these shops offered hand-loomed, tribal design silk that would make a beautiful, rich wall hanging, but the price was the same price or a little more than in Singapore; perhaps the difference was Lao silk vs. Thai silk – I don’t know but caveat emptor. After a long, hot march, I finally found what I was looking for: a shop with Buddhas – Buddha heads and hands, standing Buddhas, sitting Buddhas, wood, bronze, brass, and marble Buddhas. I was in, so to speak, Buddha heaven. I spent an hour looking, asking, thinking, petting the store dog (who may be a Buddha in the next life), and I felt both more knowledgeable and overwhelmed. That meant only one thing: time for more shopping! But first, time to go back to the hotel, change clothes, and get to the tailor for a fitting. This time, expediency overcame enthusiasm and I hailed a tuk-tuk. 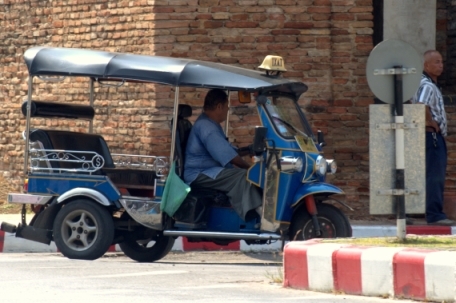 Tuk-tuk is a sort of enclosed, three-wheel, more-than-motorcycle-but-not-quite-car. A seat in the back is comfortably wide enough for two, wide enough for three with a little squeeze, but four fit only if everyone has been drinking and all caution has been thrown to the wind. A roof shields you from the sun and rain. 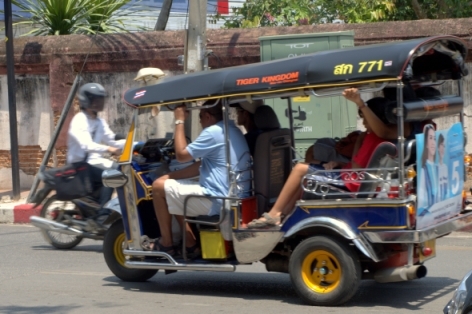 Tuk-tuk has no doors, and the roof is very low, so a little contortion is needed to get in. With no doors and no seatbelts, you hold onto the grab bars tightly. The driver sits in front, steers with a motorcycle-style handlebar, and wants to get you to your destination as quickly as possible. His English isn’t likely to be the best, so it’s good to go to an easily recognized location (“Night Market”) or to have a name card for the place you’re going. There’s no meter, so you have to agree on a fare before you get in and start off; I’m very sure there’s a two-tier price system, one for tourists and another for Thai people. Ask, “How much?” The driver quotes a price. Definitely offer something less, and the driver will drop his price a little. Maybe accept that price, maybe insist on something lower. The total savings is likely to be about 20 Baht, or something less than a dollar, but the point isn’t to save the dollar. The joy of the exchange is participation in the local culture, where the first offer is neither more nor less than the first offer. Puzzled look. I handed over the name card, and the driver squinted at the English address, then turned the card over and squinted at the Thai address, then turned the card over again and looked hard at the English address. “Ok,” he says, and I wondered whether he really knew where we’re going. “Hundred forty Baht.” Since I might not understand English, the driver held up four fingers. “Ok.” Location understood, and price negotiated, I climbed in and we instantly launched into an intense stream of traffic with gaps so small that I could not actually see them. As the engine pitch rose and the vehicle accelerated, the driver dove into spaces so small and tight that I could literally reach out and touch the neighbor car or bus or motorcycle. I don’t know how fast we were going in absolute terms, but we seemed to pass everything on the road, whether bicycle or motorcycle or car, sometimes on the right, sometimes on the left, and sometimes threatening to bounce up and over the sidewalk. The concept of lanes was dubious at best; around corners and turns, it disappeared completely. There must be some orderliness to this traffic that all the drivers intuit, because it’s not all one continuous, gigantic crash, but it looked like chaos to me. Mixed very thoroughly into this miasma are hundreds and hundreds of motorcycles. Motorcycles with one person, with two people, with three people, sometimes with a family of four! (Dad drives with Junior on his lap; Mom sits behind with Sis between Mom and Dad.) Sometimes, for modesty, a female passenger with a skirt rides side-saddle. Motorcycles everywhere, jockeying for position, in all the interstices of the traffic, like sand between rocks. Finally, after only a few – but frantic – minutes, the tuk-tuk was by the side of the road, motor silently switched off, driver patiently waiting to be paid. Back at the hotel, after a rest and in different, dry, clothes, I started to realize that my goal wasn’t really seeing Chiang Mai, or photographing all the temples in the Old City, or finding good Buddhist art at a good price, or even getting beautiful silk clothes. Seeing the next temple or the tenth temple was interesting, but it wasn’t the point. The important thing was the journey – the trip through the streets, the view of the people, the conversations that are five seconds long but entirely in Thai, the minor participation in the life and rituals of the city, learning to be a little bit Thai. Did you choose a Buddha? Did you purchase a Budda, and some beautiful silk for that wall hanging? Wonderful reading, and the pics add so much! Keep ’em coming!